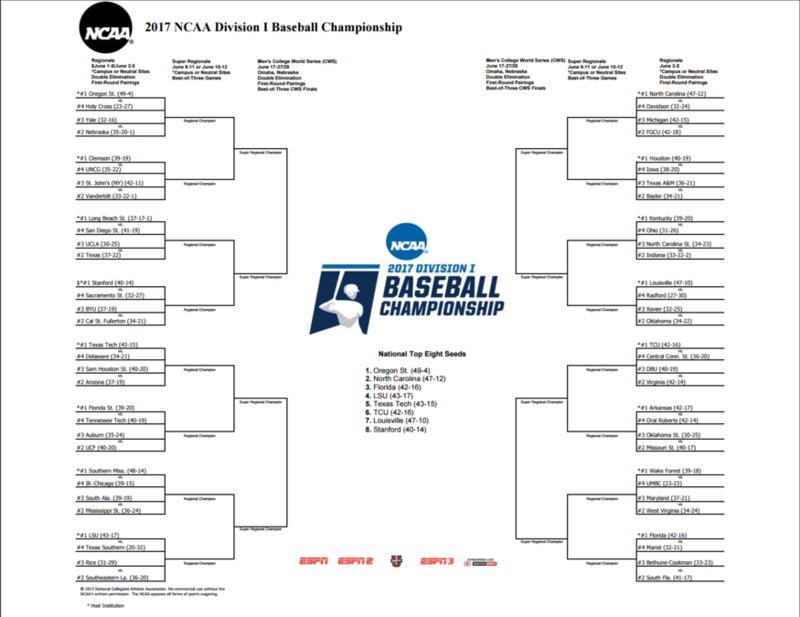 With the College World Series just two weeks away, 64 college baseball teams will navigate their way to Omaha through the double-elimination NCAA Regionals this weekend. Following the regional round is a best two out of three series in the Super Regionals for a spot in Omaha's best sporting event of the year. Most of the NCAA baseball tournament action begins Friday, with the most notable action coming from the Corvallis Regional. Nebraska will take on Yale at 3 p.m. Friday in the Corvallis regional, highlighted by No. 1 overall seed Oregon State. Iowa kicks off their NCAA Tournament with a first round matchup with Houston Friday at 7 p.m. The SEC leads the way with eight teams making the postseason, followed by the ACC and Big 12 who each grabbed seven bids. Omaha will likely see some familiar faces at TD Ameritrade Park this summer with teams like Texas Tech, Louisville, Florida, TCU, LSU, North Carolina, Stanford, Arkansas and Clemson all hosting regionals.